Produce washing and equipment clean-in-place systems play a vital role in food processing plants, ensuring that fruits and vegetables are clean and safe to eat after they are harvested, packaged and distributed to consumers. Failure to clean them or properly maintain clean equipment during their processing can lead to contamination from a variety of waterborne microbial pathogens. Outbreaks of “food poisoning” from improperly washed produce or the failure to adequately clean handling equipment or contaminated process water can have deadly results. We have all read the headlines about produce recalls due to disease-causing pathogens that are especially dangerous for people who are vulnerable to infection because of immature or compromised immune systems, including children, those with chronic illnesses and the elderly. The water used in produce washing and food processing equipment cleaning processes is an especially important element in plant operations. Periodic water testing must be done to assure the quality of the incoming source, the effectiveness of the disinfection agents and the post-process treatment of water that might be reused or released back as plant effluent into the environment. Without proper testing and analysis of the water component and levels of the disinfection agents with reliable liquid analyzers, the most sophisticated plant equipment is going to be ineffective in preventing disease. For this reason, the principle of using clean water applies throughout the farm-to-table continuum, according to the U.S. Food & Drug Administration (FDA). In past decades, FDA has issued a series of industry guidelines and regulations to produce growers, processors, and storage and distribution companies that are intended to keep produce free of potentially contaminating sources of waterborne pathogens. Many of these complex regulatory requirements vary depending on the type of produce—including raw, fresh-cut, cooked and canned—and the actual type of plant and its equipment or processes. In general, FDA has stated that water used during the post-harvest handling of fruits and vegetables often involves a high degree of water-to-produce contact. Although water is a useful tool for reducing potential contamination, it may also serve as a source of contamination or cross-contamination. Reusing plant process water without proper disinfection can, for example, result in the buildup of microbial loads, including undesirable pathogens from the crop. Plant operators should institute best industry practices to ensure that water quality is adequate for its intended use at the start, throughout and at the end of all post-harvest processes. FDA guidelines recommend considering practices that will ensure and maintain water quality during produce washing processes. These practices include periodic water sampling and microbial testing, as well as changing water as necessary to maintain sanitary conditions, including the maintenance of sanitary water contact surfaces such as tanks, flumes, etc. These sanitary practices can include the use of antimicrobial chemicals in treatment water, with chlorine and ozone both mentioned as effective treatment agents. Food processors have a variety of produce washing and equipment cleaning systems to choose from that are available from multiple manufacturers. Where necessary, the use of disinfectants such as chlorine, ozone, peracetic acid, hydrogen peroxide and other agents removes microbial pathogens from produce and ensures process equipment remains clean. The need to assure the water used is clean and that the disinfectants are strong enough to do their job are things all these produce washing and equipment cleaning systems have in common. 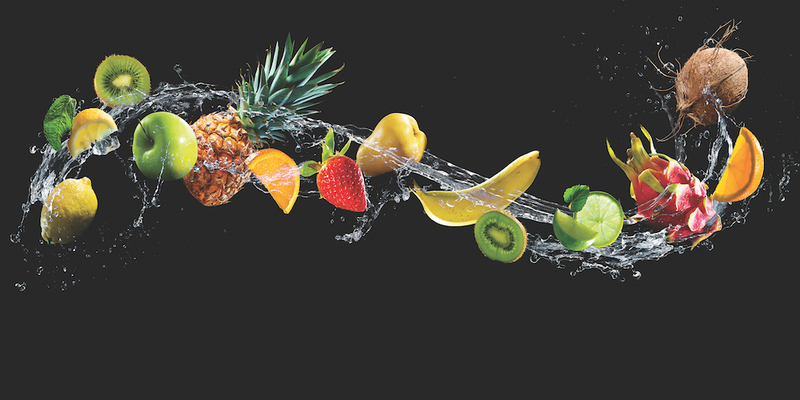 Liquid analyzers play an important behind-the-scenes role in maintaining plant water quality for the effective washing of produce and the cleaning of process equipment. Disinfection analyzers are the go-to instruments that plant technicians rely on to monitor water quality in food processing and many other industrial processes and plants. While there are many liquid analyzer manufacturers to choose from, the technologies, designs and manufacturing techniques do vary significantly in some cases. For example, some analyzer manufacturers’ sensors rely on consumable reagents to measure chlorine, ozone, pH and other industrial specific ions useful in determining water quality. Replacement reagents must be stocked, are expensive to purchase, take time to replace and require special handling for safe environmental disposal. Other analyzer manufacturers offer reagent-less designs. Built-in automatic pH compensation eliminates the need for expensive reagents to reduce maintenance and life-cycle costs. Conventional analyzers typically come with multiple components that must be installed individually and then require field calibration, which makes them more complicated and time consuming for technicians to set up. On the other hand, panel-mount analyzer systems are completely factory assembled and factory calibrated prior to arriving at the plant. They are virtually ready to go out of the box. All the technician needs to do is mount the panel, connect the drain lines, plug in the power cord and select the outputs on the display. For food processors, there are multiple water disinfection options that require agent-specific analyzer sensors. Deciding which disinfection agent to use depends on a variety of factors, such as the end product, equipment, plant, water source and more. No matter which disinfectant is chosen, there is a liquid analyzer available for water quality testing purposes. Chlorine. High-concentration chlorine (Cl2) disinfection is utilized in a variety of food processing operations and produce packing lines. All these Cl2 disinfection applications require the introduction of liquid or solid Cl2 into water tanks that are connected to washer or spray line systems. Liquid chlorine and hypochlorites generally are used in the 50- to 200-ppm concentration range with a contact time of 1 to 2 minutes to sanitize produce surfaces and processing equipment. Hypochlorous acid (HOCl) is the form of freely available chlorine that has the highest bactericidal activity against a broad range of microorganisms. In produce disinfection applications, the analyzer typically monitors free chlorine that can range from 0.05 to 200 ppm for supply water, cleaning and disinfection of water supply lines, and cleaning solution water samples. Maintaining proper Cl2 levels in disinfection processes helps ensure the elimination of disease-causing pathogens, including E. coli, Cyclospora, Salmonella and hepatitis. Ozone. Ozone (O3) is a colorless to pale blue gas that gives off an irritating acidic odor in low concentrations. It is a strong oxidizer, stronger than either chlorine or chlorine dioxide. O3 reacts quickly and disintegrates into oxygen gas without the formation of harmful disinfection byproducts (DPBs) common to chlorine disinfectants that require additional costly treatment. O3 also increases the amount of oxygen in the water. While its use is growing in municipal drinking water plants, it also can be used for food processing. Depending on the application, food processors can require different O3 levels, and analyzers that have selectable range settings are flexible in terms of giving the process team choices. Peracetic Acid (PAA). PAA is a colorless liquid with a characteristic pungent odor similar to vinegar. PAA is produced by a reaction between hydrogen peroxide and acetic acid. Produced typically as an equilibrium solution combining these agents, PAA is supplied in concentrations of 5% to 15%. PAA is a powerful oxidizer that eliminates pathogens and is stronger than either chlorine or chlorine dioxide. It simplifies process monitoring to ensure disinfection without the need for potentially harmful DPBs. It decomposes naturally into acetic acid and water, and it does not form a residual that has to be removed from the treated water. Hydrogen Peroxide. Hydrogen peroxide (H2O2) is a strong oxidizing agent. This chemical is a colorless, bitter-tasting liquid that smells similar to ozone. H2O2 is used as an alternative to chlorine due to its bleaching characteristics. Unlike chlorine, H2O2 has no toxic residue, and it is the main choice when it comes to food process applications. H2O2 is soluble in water, so aqueous solutions of proper dosing are needed to meet food processing standards. Hydrogen peroxide frequently is used in food processing industries. Proper dosing of H2O2 is important in maintaining a safe and healthy plant environment along with the output of products that meet cleanliness and purity standards. When H2O2 is handled properly, it is a safe and easy-to-use chemical. Maintaining water quality is essential in produce washing operations and in ensuring the proper cleaning of plant equipment. Liquid analyzers are the behind-the-scenes instruments responsible for ensuring levels of disinfection agents such as chlorine, ozone, peracetic acid and hydrogen peroxide are at sufficient strength. Without the reliable analysis of water and disinfection agent strength, the best processing equipment and facility employees are no match for waterborne pathogens. Eric Kim is senior engineer for Electro-Chemical Devices. Kim can be reached at [email protected] or 714.695.0051.